Like all the Python people, Eric Idle has participated in numerous Python TV series, films and specials. Although never intended to compete with the great song-writers, the Python songs have nevertheless made a cult impact on succeeding generations as this brand of humour is rediscovered. Eric Idle holding the chair as resident song-writer on the team, is responsible for a good many of these ditties. Idle sang many of the Python songs too, and he also plays guitar. He also has something of an Entrepreneurial spirit as it was Idle who secured key funding for the film "The Life of Brian" by approaching former Beatle George Harrison. Perhaps the one single song with the greatest impact is "Always Look on the Bright Side of Life" as originally sung at the close of this movie (and arranged by John Altman). This cheerful optimism in the face of hardship and even death often characterised the characters played by Idle in the series. The song was also sung by Idle at the funeral of fellow Python, Graham Chapman (highlights on this video). Among other places, the song featured on the movie "As Good as it Gets" arranged by Hans Zimmer and sung by Art Garfunkel during the end credits, as well as a few snatches played by Jack Nicholson's character on the piano during the movie itself. In 2009 the Python Team celebrated their 40th anniversary. A concert to mark the event was held in the Royal Albert Hall and here is a video of Idle singing Always Look on the Bright Side of Life and Michael Palin singing the "Lumberjack Song", and in 2012 Eric Idle performed "Always Look on the Bright Side of Life" at the closing ceremony of the London 2012 Olympic Games. Another song-writer who is also known for his witty songs is Neil Innes (sometimes known as the 7th Python). It was Innes who wrote the musical material for "Monty Python and the Holy Grail" and starred in his own TV show "The Innes Book of Records". After the Pythons broke up, Idle wrote the sketch-based TV show "Rutland Weekend Television" (with Neil Innes providing the music). A recurring set of characters on the show was the group "The Rutles" a fictional pop group parodying "The Beatles", with Innes and Idle playing two of the "Prefab Four". George Harrison was friends with Innes and Idle and the pair bounced ideas off Harrison and persuaded him to make a guest appearance on the show. "The Rutles" appeared on other shows in the US where the group even made a short comeback tour in 2008 called Rutlemania. Idle's affinity for humour in music also came to the fore when he was approached by Jonathan Miller to play the part of Ko-Ko (the Lord High Executioner) in Miller's English National Opera production of Gilbert and Sullivan's "The Mikado". Eric Idle later got together with composer John DuPrez to adapt the "Holy Grail" material, adding old and new songs including "Bright Side of Life" to create a Broadway musical version of "Monty Python and the Holy Grail" under the title "Monty Python's Spamalot". This is a great satirical show starring Tim Curry, whose soundtrack is available at Amazon.co.uk or Amazon.com, and the piano/vocal sheet music for this hilarious musical is available from The Music Room. After nearly two years of success on Broadway, the musical launched in 2006 in London's West End including many well-known actors such as former Doctor Who Peter Davidson. Monty Python's The Meaning of Life - Idle wrote many of the songs (some with John DuPrez) though it was fellow Pythons Michael Palin and Terry Jones who wrote the lyrics for the big musical number "Every Sperm is Sacred"
As Good as it Gets - that song again! Boxtrolls - scored by Dario Marianelli with Idle writing "The Boxtrolls Song"
One Foot in the Grave (TV theme song) - arguably treading similar ground to "Always Look on the Bright Side of Life"! The Website of Monty Python's Spamalot has some brilliant Python humour and animations, along with information and clips from the show's many songs. The best bits of "Monty Python's Life of Brian" including the song "Always Look on the Bright Side of Life" are available on the soundtrack album at Amazon.co.uk or Amazon.com. 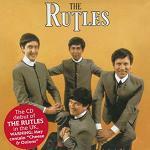 There are a number of albums available by "The Rutles" including the album called "The Rutles" which can be found at Amazon.co.uk or Amazon.com.